You might remember this beautiful mama from our NYC and Greenwich CT maternity photography shoots in 2015. You can check them out here. Pictured here is Elizabeth at 32 weeks pregnant with her third child. Elizabeth is one of my dearest friends, and this is our third maternity session together. We’ve done studio maternity portraits in NYC, and Greenwich CT pregnancy shoots at her home and at the beach. It seemed like an outdoor Manhattan maternity shoot was one of the few settings left to do together! UPDATE: you can check out the family maternity beach shoot we did a few weeks later in, Greenwich CT. See the photos, and a slideshow of past shoots, here. One of my favorite things about being a portrait photographer, is working with clients repeatedly over the years, and documenting their families grow and change. It’s been so fun documenting Elizabeth’s pregnancies, and each new little addition to her family. She and her husband are such a lovely couple and such wonderful parents. We are doing a family maternity shoot with her husband and children in Greenwich CT in a few weeks. Not sure which I prefer for this location: the smiling portrait or the serious. We did our shoot on a weekday evening. This is one of my favorite times for a shoot. Yes, Elizabeth had been at work all day, and yes she had to make sure she had evening childcare, but we had wonderful lighting, and an uncrowded City. Thank you for making it work, Elizabeth! Elizabeth’s first pregnancy (in 2012) was my first maternity shoot ever. 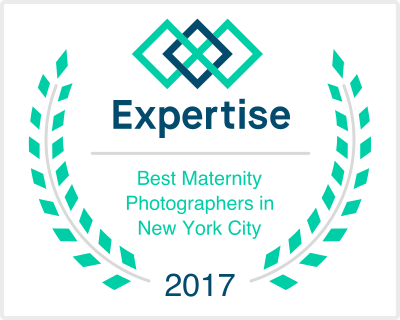 In the weeks leading up to this most recent shoot, I was voted one of the Best Maternity Photographers in NYC! Oh, you thought we’d just do Central Park maternity photos? After that, we shot downtown to Greenwich Village Manhattan and did a few studio portraits too. Elizabeth is one the kindest, funniest, smartest people you could ever hope to meet. She impresses me in so many ways, and I’m so honored and proud to photograph the exciting milestones in her life. I can’t wait to meet Baby 3! Want maternity, newborn, or family portraits of your own? Contact me here to get in touch! Spring and summer shoots are now in full effect in NYC, the Hamptons, Greenwich CT, etc. I’m also offering shoots on Nantucket in August. Don’t sleep on those holiday card photos, people. Maternity Photography – when to do a shoot, wardrobe, etc. For more information about pregnancy photography (best time for a maternity shoot, etc) please click here. I can come to you, you can come to me, whatever you prefer. And yes, I offer retouching and have dresses you can borrow for the shoot! These shoots are such a blast. And yes, we can do milk bath maternity photography. You can read about that here. If you’re wondering about newborn photography and want a little more info, please click here. If you’re expecting a baby, please book your newborn shoot before your little one arrives! Time is of the essence and I hate not having space for newborns. A few weeks after Elizabeth’s Central Park maternity session, we reunited in Greenwich CT, for some family photography in Old Greenwich. We wanted to include her whole gang in the fun, and get some photos on her home tuft. You can see her Greenwich family session here. And don’t forget to check out my 15 Family Photo Session Tips, one of my most popular blog posts. I hope it’s helpful in prepping for your family photo shoot! So don’t be shy – get in touch! Daisy Beatty is a portrait photographer based in Manhattan NYC and East Hampton NY. She specializes in vibrant, heartfelt images of families, children, newborns, and pregnancy. And winning headshots for corporate websites, actors, models, artists, and online dating. She proudly serves NYC (Manhattan, Brooklyn, Queens, The Bronx, Staten Island), and Hoboken NJ, Westchester NY, Greenwich CT, and Boston MA. Want Daisy to come to you? Just ask! In the last 2 years Daisy has done shoots in Turks & Caicos, Barcelona, Iceland, Dubai, Martha’s Vineyard, and Nantucket.